Getting everything set up on my 3DS wasn’t too bad. The music is incredible in this title, I’m so happy with the music. I’m up to the 3rd case now. It’s got a lot of very interesting elements even if it’s taken a pretty long time to get started. I’ve been impressed a couple of time with how the 3rd case is set up. Does anyone know of anywhere besides Play-Asia and Codashop to buy Play Store codes? Codashop didn't work for me and Play-Asia is out of stock. Reading the thread it doesn't seem many agree with this though lol. I'm personally inclined to say it's been one of the best so far. I think some folks don't like the results of cases or the tone they take on. DGS is much more darker and somber than the other entries. Can't speak for others, but for me personally, after a great case 1, having a case 2 that is investigation only and case 3 trial only is pretty underwhelming. It will probably pick up for the final 2. Now i have to pirate my other 3DS and restart the whole thing from the beginning, i was at case 4! Does anyone know if you can transfer savefiles on 3DS from PC? And if so, would someone please send me a savefile of the game? Is the Android version watered down/stuff removed, or is it just as good as the 3DS version? I don't own a 3DS anymore, and wish to play it via Android. Guess I gotta look into this... if we get more fan translations of Japan exclusive 3DS titles, the system will never die even if new releases dry up. Same basically. I just hear there's some bugs. But apparently it runs great on. Bluestacks. Today both games have arrive to my house :D I'll start the first one this night. Knowing the great work behind the translation, I'll wait patiently the translation of the second game. I'm very grateful to the translation team. Thank a lot! Anyone who finished it on 3DS, please, can someone share me the savefile? I really don't want to go through all the cases again! Ya know, I wonder if someone could show/translate proof then in this case. I wonder if it's truly as racist as a screencap showed in the original Japanese. Checked videos on youtube when this popped up. The only thing I can confirm for sure is the word Nipponjin is thrown around a lot. Invoking prejudice to sway a jury is actually pretty damn realistic too. She literally does say those words. 黄色い (yellow),　顔 (face), 日本人 (Japanese Person/Nipponjin). Quite literal. I believe The Scarlet Study version is pretty similar too. This is an interesting case to me, because this goes back to the fact that now outside of localization, this is a japanese developed game and japanese writers chose to do this. I really can’t think of any reason 日本人 needed to be localized as J**. It’s historically inaccurate as a slur, and while it may be historically accurate simply as a shorthand for “Japanese person”, it’s hurtful to people today, so I’d have hoped that would have disqualified it from use. This game is using 3D models for the characters, right? These look really good. Yup and has more animation than 5/6 to boot. The models/characters are so lively and full of personality. Yes. The models are great, but even more amazing is their animation. They way they move is really something incredible. Actually makes it hard to look at the new trilogy release because of how animated the models are. Fluid movements and not simply sprite transitions. I have yet to actually play an Ace Attorney game that uses 3D models, this is the first one. I was expecting them to be more juxtaposed, but they blend extremely well with the backgrounds. So much so that I can't really even tell that they are models until they move/talk. I don't like the 3D models, they move too much and yet still look worse than Apollo Justice. There's just something off about them. Don’t get me wrong, there’s absolutely racism towards the Japanese characters, and I would never want that localized away. It’s part of the story. The issue here is the use of the J** slur, which was not in the Japanese dialogue, and really has no place being here from either a historical perspective or a modern perspective. There are other ways to express the racism at play. Dunno about that one, the sixth had the customs small cutscenes such as rayfa dance, the Bonny reveal etc. that, as for where i'm at in case 3, was the most animated the series ever was. I think DGS stands out with just how expressive its characters are. Ryunnosuke is probably the best example, because they nail his awkwardness so well. Little details like his eyes darting around, his awkward “Hai!” arm raise thing(?? ), the way he slams into the wall before collapsing into the bench... it’s all so good. One thing about the animations in this is that, iirc, all of them are done with motion capture while AA5 and 6 (except for a few scenes like Rayfa's dance) are done via animators. I really like DGS's animations because of that since it makes them so realistic and beaming with personality while AA5 and 6 seem really stiff to me, like they were *trying* to make them in the vein of the 2D sprites and their simpler animations. Capcom Japan showed off one of the motion capture performers in some promotional videos, behind the scenes, and I remember seeing her during one of those streaming events Capcom Japan does. They did a playthrough of Case 1 and it was fun watching her do some of the motions as they played. Yeah, my aim was def not to knock on dgs animations, since they look really great visually and are rich in details. (Really love those in the joint reasoning.) I was more talking about the quantity as length, since spirit of justice had multiple mid cases long anims. Yeah, the feel I always got from 5 and 6 was “these are the classic sprites but 3D”. Not that that’s necessarily a bad thing though, because I was pretty into it. I was really worried about the 3D transition and I thought they nailed it. Oh, I see! I kinda was just curious is all. They could easily have changed it to "Japanese person" or something else, I do agree.. I do say that the Conan Estates thing is the big reason this will never get localized. The music is definitely a bit different from the mainline games, but I wouldn’t say so. The tempo of the pursuit theme is too fast for an objection theme IMO, and vice versa for the objection song. After getting my Amazon JP package in the mail, I finally got my 3DS all settled and ready to run the localization, only took me an hour or so. Its amazing how far we've come with getting translation/game mods on the 3DS! I'm only about 1/2 though the first case and it reads and plays like a professional translation. I'm very impressed! Yeah, I thought the same way back when the game was released and I just knew the tracks. They're different from the usual Objection and Pursuit themes, but ingame they work perfectly regardless. Finally managed to buy a 3000 yen card on Play-Asia this morning, bought the game and got it patched. Works perfectly. I was going to buy the other two games in preparation for their future patches, but Play-Asia is already out of stock of 3000 yen codes again! Offgamers was the site ScarletStudy listed that I ended up using. I ended up paying $33 for a 3000 Yen card. It even allowed me to use PayPal which made me feel a little more secure. I also thought about going ahead and buying 2, but it just makes more sense to cross that road when we get there. Just started this. Naruhodou's animations are hilarious. On DGS's Pursuit, I tend to like music if it gives me some kind of mental image. The majority of the Pursuit themes give me the image of a chase of someone panicking and trying to pick up the pieces of their scheme falling apart. This is done in game via you and another character shooting arguments at each other in rapid succession which is enhanced by the blur effect as the camera snaps back and forth. It's like a rally at a tennis game. With DGS's Pursuit, I didn't like it very much for a couple of reasons. One, the song is notably slower than any of the other pursuits and two, the cases are not terribly complex or intricate in DGS1 so there isn't a lot of "THIS CHANGES EVERYTHING!" moments that would spur on the excitement of a Pursuit theme. It never gave me an interesting mental image. But DGS's Pursuit grew on me because it's fits the concept of Naruhodo, a foreigner and an outsider to institutionalized standards and systems...and then breaking them down with nothing but his words. Like an exaggerated form of parliament debates. The song gives me an image of a stone structure or prison crumbling apart after having one brick removed and the person who made it is scrambling to stop it. Civilized chaos. Thanks, I did try using Offgamers at first before Play-Asia restocked, but I didn't have a great experience. I paid via PayPal, and my order got stuck in verification. After a while I emailed them my PayPal receipt and asked them to complete the order. They replied asking me to send them all sorts of personal information (a driving licence scan, a scan of the front of my debit card and a photo of myself). There was no way I was sending that sort of personal information to a company I barely knew, so I replied that the PayPal receipt contains all the information they should need and asked again for the code to be sent. They refused and I requested a refund. To be fair to them they did refund me quickly. Did they explain why the trunk beneath the seat in the coach was filled with stuff at the beginning of the trial? After all during case 5 Gina tells you she indeed hid there during the murder. Oh wow, that is weird of them to ask for that. The only out of the ordinary thing for me was PayPal marking it as a suspicious transaction during the verification phase, but l had to do was reply yes to a PayPal text to confirm that it was me. DGS is very good for folks like me who enjoys a good drama and isn't picky. One of my favourite cases is AA1-2 despite being very easy, it's just that the case has excellent drama. Never outright said but it can be assumed that Beppo filled it before Case 3's trial started as just part of his "routine" because he wasn't aware it was empty on that night and Megundal realized that clashed with his planned scenario to clear him, so he had his goons / Gina empty the seat during the smokescreen. Gina did empty the seat on the night of the murder, saying she dumped the stuff in an alley while Beppo was getting food. As someone not into Android emulation, how does this (IrisMobile /TGAA on Android) work? What would I have to to and where to buy to play this on Android? Finished Case 4 - I didn't like it as much as 3, but it was still pretty good. Excited for Case 5! 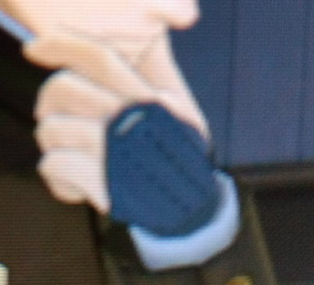 What does Naruhodou wear on the back of his hand? The closest thing I've found is a "kote" used in kendo, but I couldn't see anything in the context of uniforms.